Don't let snow banks and cabin fever keep you inside this winter! Get out and explore all the North Country has to offer - at a great price. 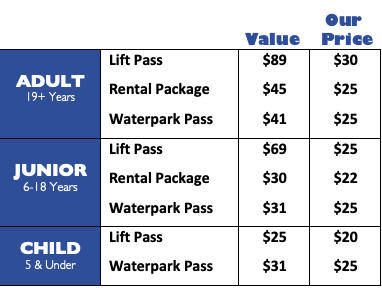 Our friends at Jay Peak have passed along some amazing deals on water park admission, lift passes and rental gear for the whole family when you order through Newport Parks & Recreation. Special pricing is only available for Sunday use at the mountain. To receive discounted rates for the weekend, orders must be submitted and paid in full before the rolling deadline at noon on Fridays. Cash or check payments are accepted at our office or pay online or by phone using a card. Indoor basketball leagues are hosted throughout winter in the Newport Municipal Gym. These friendly, competitive 4v4 leagues accept teams of all skill levels and abilities age 16+. Teams can expect to compete in at least one game a week for 14 weeks. A culminating playoff tournament is scheduled for the end of March. Teams of 6-8 must register by November 9th with Newport Parks & Recreation. If you are not affiliated with a team, but still wish to play, please attend the meeting or email us! Pickleball is one of the fastest growing sports in the country and it's taking off in Newport. Combining elements of tennis, badminton and ping-pong, the rules are simple for beginners to learn, but can develop into a quick, fast-paced, competitive game for experienced players. The game is played in singles or doubles using a paddle and plastic ball. Played on both indoor and outdoor courts, this drop-in group switches between Gardner Park and the Newport Municipal Gym with the seasons. To join, simply stop by ready to play in comfortable clothes and sneakers with a water bottle. No prior experience needed, bring a paddle if you have one. Basketball is a lifetime sport and whether you're fresh out of high school or new to the senior club, this league is for you! Stop by to shoot hoops with a casual group of players ranging from age 16 to 66. This league is open to all abilities and skill levels, age 16+. There is no commitment or pre-registration required to play, just show up with your water bottle and dry pair of shoes. ​Join a great sport with a supportive group of women! NO EXPERIENCE NECESSARY to join this group. All you need is a water bottle and a dry pair of shoes. Pick-up style format means no commitment, just come when you can. This is a great mother-daughter, sister-sister activity, a great way to meet new people and get some fun exercise! Must be 16 years or older.